When I received Angelique's request to swap AA page with me privately, I immediately accepted it because her work was so nice to have one though I had felt a bit tired and needed a rest after a year AA swap of Fiber Fever group. Her work for me is so beautiful, isn't it? I've made this for her. I've been playing with scraps for a few days. 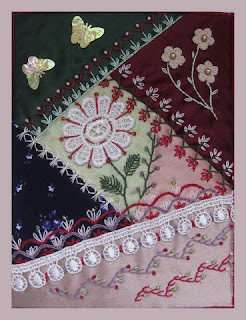 For pot holders or place mats. My eyes gets worse and worse, and my concentration isn't kept so long as before, I can't read through a book at a stretch. But I am always having some books to read besides me. I am reading very slowly now but I've just read Kaiko Takeshi's "Darkness in Summer", "Into a Black Sun" and his last unfinished novel, which are called trilogy. Fortunately a few of his work are translated into English. I really recommend you his novels to read. I've finished my old DYB block for myself. An only few members remember this "Inspiration DYB" of CQI and it might be a history now because it's the first DYB trial in the group. It started from 2006 spring, four years ago. You would see how we tried our best for the first challenge. Though I had been keeping my own block as naked for years, finally I decided to start. Here are the six blocks. After thinking I chose the position like this. You can see other members tremendous work here. This is my July AA page for Ati. The title/theme is "A midnight Garden". Our CQ class will have a second exhibition in mid November. I am planning to finish my UFOs of RRs and swaps to introduce oversea CQers work and style, by using their beautiful blocks I've got. I would like to complete as many as I can by then. I've sewed those blocks into a healing heart wall hanging, though still in progress. The heart were made, from left to right, by Ati, Anne, Hideko (upper), Maureen, Rengin, Helina(middle), Hideko, Maureen, Margreet(bottom).